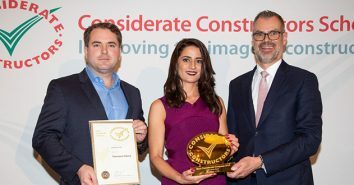 The awards took place across two ceremonies at the Royal Institute of British Architects (RIBA) prestigious landmark headquarters in central London. Over 350 guests were in attendance, to recognise the highest performing companies and suppliers that have demonstrated excellence in relation to the community, the environment and their workforce. 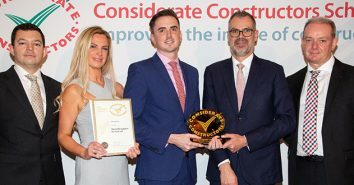 Scheme-registered companies in each of the four award categories – based on annual turnover- were presented with the coveted Most Considerate Company 2018 award, and the highest performing gold award winner of the registered suppliers was awarded Most Considerate Supplier 2018. In total, 23 Gold, 45 Silver and 61 Bronze Awards were presented across the ceremonies, while 9 companies and suppliers were acknowledged as Most Considerate Runners-up. Established in 2002, Optik Leisure Ltd is an interior refurbishment company based in Stone, Staffordshire, comprising just two full-time employees. Despite being a very small company, Optik Leisure packs a huge punch in terms of projecting an exemplary public image, with two low emission vans proudly displaying the CCS bronze award winner signs and company details. Creating an enduring community legacy, this company sponsored an under 15s female rugby union team in nearby Trentham, as well as funding two occupational nurses specialising in prostate cancer screening. This resulted in 300 local men being tested, sparking a letter of thanks from the Stone Lions Club charity. Fully recognising the impact of this potentially disruptive fit-out work, the team takes a highly sensitive approach to all of those affected. Just one example was establishing in advance that four people within a building were allergic to the latex compound they were planning to use. It was therefore arranged for the work to be carried out during the days and hours the affected workers were off site. An equally considerate approach is also taken with respect to the workforce, with this close-knit and loyal team sharing an apartment to reduce travelling to projects. With over 50 years of experience in the leisure and commercial sectors, Optik prides itself on its loyal band of customers whose testimonials on the company website and social media speak volumes about the levels of this company’s consideration. Based in Chingford, east London, Impact Roofing and Building Ltd is a subcontractor specialising in roofing repairs and replacements, from very short duration maintenance to entire roof renewal programmes. In just its second year of registration with the Scheme, this company has spared no effort in addressing areas for development, taking every opportunity possible to raise compliance levels – a big investment for a smaller business. The workforce is presented in clean, branded PPE, while immaculate vehicles promote the company website and values, and operatives make every effort to share #loveconstruction on social media and via email messages. Taking an equally considerate approach towards the environment, the company has achieved ISO accreditation and all supervisors have undergone Site Environmental Awareness Training. Being a family-oriented business, this close-knit team of employees are all well-known to the company owner, who prides himself on creating a healthy, safe and happy workplace, with regular teambuilding events and reward programmes in place. With goodwill extending into the community and complimentary works including a roof renovation for a neighbourhood centre, this highly considerate company’s exemplary approach is an inspiration for the industry. Thomann-Hanry is an exterior building, cleaning and restoration company which uses specialist, patented, access equipment and systems, eliminating the need for scaffolding. All of the company plant and vehicles (some bespoke to them) are consistent in their professional branding and scrupulous cleanliness and appearance, matched by a workforce wearing custom-made, branded kit, uniforms and PPE. As well as projecting a superb image, the company has developed a system of working which minimises the impact of building and cleaning works in busy or strategic locations, allowing the public to go unhindered about their daily business. In terms of the environment, the company’s impressive work procedures create zero levels of pollution, with 100% recycling and reuse of materials. The company has installed and developed a mobile treatment plant at the works to separate particles from waste water for reuse – an outstanding achievement for any company. With similarly robust approaches taken towards safety and the workforce, demonstrated by an “infectious” team spirit and close bond between the management and workers, this company was described by the Scheme Monitor as “one of the most considerate employers I’ve met”. Munnelly Support Services Ltd specialises in logistics management for main contractors on capital projects throughout the UK, carrying out operative supply, construction, security, waste management, infrastructure and airport solutions. 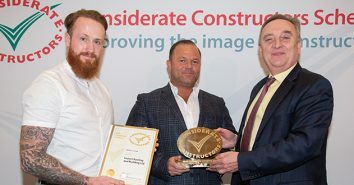 This company’s “outstanding appearance” is maintained through its robust working procedures and systems, working in close collaboration with the main contractor whose own performance with the Scheme has been elevated as a result. Enjoying a rich community involvement, the company hosts site career open days as part of its proactive recruitment and training programme, giving construction presentations at local schools and also benefiting many good local causes. As well as being a CLOCS Champion, this company has exceptional systems in place to care for the safety of the public, visitors and the workforce. All traffic marshals receive additional training as first points of contact and act as site ambassadors. Going above and beyond, traffic marshals were posted up to half a mile away from one site to ensure delivery drivers and visitors successfully negotiated a new road. 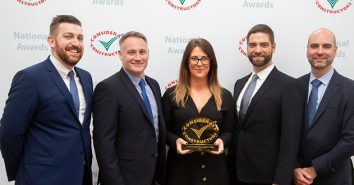 With a clear commitment to workforce respect, fair treatment and diversity, as well as a concerted focus on occupational health, lifestyle and wellbeing, this company’s outstanding dedication to the Scheme is an inspiration for the whole industry. Norris is a leading waste management and recycling company providing services to construction companies from licensed transfer stations in Kent, as well as a new facility on Greenwich Peninsula. Building up an enviable and highly-deserved reputation at the forefront of industry best practice, Norris has been registered with the Scheme for almost eight years and has consistently achieved the highest CCS Awards year-on-year. This year is no exception, with the company continuing to go above and beyond to devise and implement the very best industry practice, a prime example being the recent introduction of a new Professional Driver Recognition Scheme. Offering three levels of accreditation to drivers, this scheme is linked directly to driver bonus pay with targets set for each level, mainly relating to safety but also the aims of the Scheme, An additional initiative was the introduction of complimentary feminine products in the women’s toilets, enhancing its already comprehensive range of health and wellbeing workforce provisions. Creating a highly unified and positive image, all vehicles are kept immaculate with drivers wearing uniforms, including beanies and baseball caps. A strong corporate identity promotes both company and CCS values to the workforce, public, clients and contractors in all of its endeavours. Taking justifiable pride in providing the same level of customer support to the largest construction project or a single skip hirer, this forward thinking and innovative company continues to lead the way as a shining inspiration for the industry. Click here to view details of all award winning organisations on the Scheme’s Construction Map. 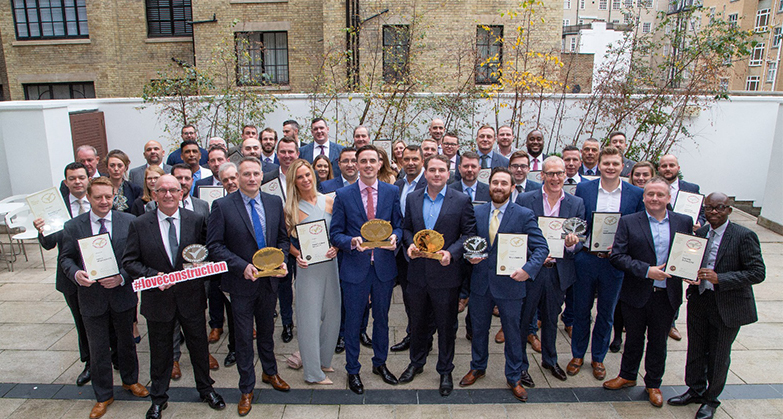 On behalf of the Scheme, I would like to congratulate all of this year’s National Company and Supplier award winners, with special congratulations to the 2018 Most Considerate Companies and 2018 Most Considerate Supplier. Winning an award is an immense achievement and one which is highly regarded throughout the industry. 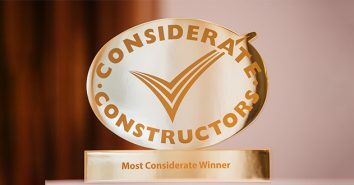 Each award winner should be hugely proud of their achievements in helping to raise the standards of considerate construction across the industry. Select the thumbnails below to see a selection of photos taken by professional photographers from across the 2 brilliant ceremonies. 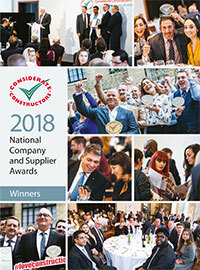 The Scheme published a special edition awards brochure which lists all of the 2018 National Company and Supplier Awards winners. Copies of this brochure were sent out to all 2018 National Company and Supplier Awards winners.